The detained leader of the Islamic Movement in Nigeria, IMN, Sheikh Ibraheem El-Zakzaky who has been in Nigerian custody since 2015 after clashes between troops and his followers made a rare public appearance in court on Tuesday to face criminal charges. The post El-Zakzaky, wife whisked to Kaduna for murder trial appeared first on Vanguard News. 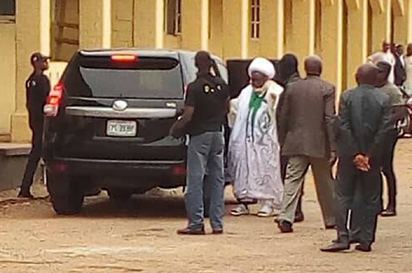 Ibrahim Zakzaky and his wife were brought from Nigeria’s capital of Abuja to the Kaduna State High Court to face charges including culpable homicide and unlawful assembly. It is only the second time the leader of the Shiite Muslim Islamic Movement of Nigeria (IMN) has been seen in public after being taken into custody. Despite court orders that he should be freed, Zakzaky has been detained since December 2015 when the bloody clashes broke out in the northern city of Zaria. “His health has been fading and if you had an opportunity to see him today it is obvious and clear,” Zakzaky’s lawyer Maxwell Kyon told AFP. “He needed a stick to get around,” Kyon said, adding that Zakzaky’s eyesight was poor. Kyon said that this was the first time he had been able to talk to Zakzaky after the court ordered the cleric should have access to his legal team. “We were only able to speak with him and his wife for a period of five to ten minutes,” Kyon said. The courtroom was guarded by soldiers and members of the public and media were not allowed inside, according to IMN spokesman. 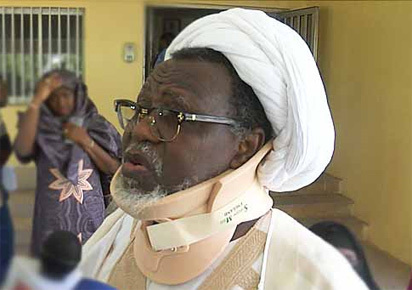 Zakzaky was supposed to formally be charged but because other defendants were not present the case was adjourned until June 21, said Dari Bayero, director of public prosecution for Kaduna State. “We couldn’t go on because the other defendants haven’t been served,” said Bayero. “He (Zakzaky) was asked to be kept in custody of the state security service,” Bayero said. Zakzaky, who is in his mid-sixties and has lost the sight of one eye following the 2015 clashes, has been at loggerheads with Nigeria’s secular authorities for years because of his call for an Iranian-style Islamic revolution. His supporters have held a series of protests in Nigeria’s capital of Abuja in recent weeks to demand his release and have had a series of standoffs with police. Rights groups have accused Nigeria’s military of killing more than 300 IMN supporters and burying them in mass graves during the 2015 confrontation, a charge the military strongly denies.